What level of broadband should be available to our residents, businesses and Anchor Institutions that would allow residents to pursue their interests, businesses to compete and expand their businesses, and Anchor Institutions to fulfill their missions? This was the question that the Broadband Working Group discussed as they developed draft one of county Broadband Goals and Strategies at their first meeting in December 2016. With input from the community, this document is now in a final V6 form, and is collecting endorsements from around the county. Ultimately, this document will be brought before the Board of Supervisors for official county endorsement. If your organization or business would like to endorse these broadband goals and strategies, please fill out the above endorsement form, and email to Trish@MendocinoBroadband.org. Or email to ask for a WORD version of the endorsement form. 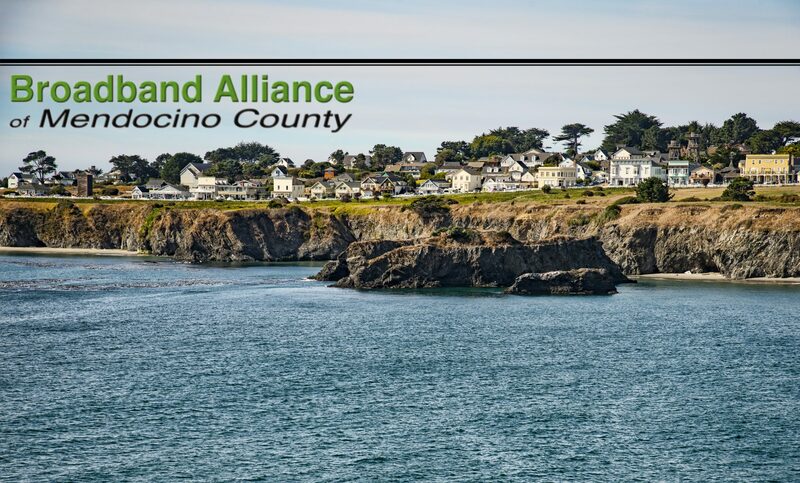 Broadband Alliance of Mendocino County Broadband is essential for economic development, and we are happy to see the county take a leadership role in helping businesses and residents obtain the broadband they need to succeed in today’s business environment. Economic Development and Financing Corporation EDFC believes that the Mendocino County Broadband Goals and Strategies are an extremely important and integral part of the economic development of the County. Community Foundation of Mendocino County The Community Foundation supports the Broadband Alliance of Mendocino County in working to ensure that the county’s population has affordable universal broadband access in their homes, businesses, and public places to support economic viability, ensure health and safety, and access educational opportunities. From the United Nations to France to Finland, broadband is now recognized as a basic human right, yet many areas of our county remain underserved. Mendocino County Office of Education Broadband is important for a student's education, both at school and in their homes as Internet-based curriculum increases. Without broadband at home, students face barriers completing assignments which puts them at a disadvantage. Mendocino Coast District Hospital Broadband has become a critical component of the Healthcare Industry. Not only is hi-capacity, reliable broadband needed for increasing our efficiency as a facility, the increasing use of electronic communications with patients, such as patient portals, necessitate bandwidth availability for all residents, especially rural residents. Westport Municipal Advisory Council Westport Municipal Advisory Council endorses these Broadband Goals and Strategies for Mendocino County. The Westport MAC serves the coastal area from Ten Mile River north to Rockport, an underserved area as related to Telecommunications in general and Internet based digital service specifically. There are two economic realities facing our area. First, broadband service is necessary to both attract and keep residents. Lack of service restricts residents ability to interact with the private sector, services, and government agencies. Second, our area is economically unattractive to larger established providers of broadband service. The Goals are good. To have any chance of reaching them for areas like the Westport vicinity, the strategies and tactics will have to remove barriers and add incentives, especially to smaller more entrepreneurial providers of true broadband service. The future of communities like Westport will be positively impacted by availability of quality broadband service as de- scribed in the Mendocino County Broadband GOALS and STRATEGIES document. Lack of quality broadband services will have a chilling effect on the communities future. Hopland Municipal Advisory Council The Hopland MAC endorses the goals and strategies of the Mendocino County Broadband initiative. Mendocino Coast Broadband Alliance This document was well thought out by many who care, and are knowledgeable. This is a complicated topic that needs constant pressure so rural Mendocino residents can be served. Without broadband, they cannot thrive in the USA or world. I stress that all the cities need to get in on this with vigor. It is at their level where the need is most obvious. They need to do their part to support the County.